It took us a week but my site on Apple’s Swift programming language has officially launched! Swift is an ultra modern language. It’s always good to be clued into the cutting edge. 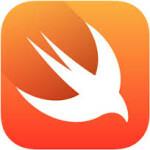 Swift will open up the doors to speedy iOS programming. There’s good money in them Apples! I just watched the presentation on Apple’s new programming language: Swift. This means the end for Objective C and it fundamentally changes the world of iOS programming. It is much easier to learn and much easier to work with and so we will see it used by a lot more programmers. It looks like a modern scripting language that shares similarities to Python and other modern nimble languages. I just took a quick look at some Swift code and it is indeed much easier to learn than Objective C.
… It seems pretty clear the ’94’ above is an int and not a string. Anyway, I just started looking at this language 20 minutes ago and I have a lot to learn! But, from what I’ve seen so far, and from what I’ve seen with the new Xcode tools and Swift Playground (which gives you live feedback of your code) I think this could be a great language to learn and teach with. More to come I think.